Sorry about the bad, football-related pun of a title, but the Super Bowl is only a few days away. Anyway, it’s time for some more catching up, though I have to warn you that, unless you happen to be one of those types who enjoy reading about someone else’s yard, you may find this one to be a bit of a snoozer. It’s not even very homesteady, when you really get down to it. Still, these things need documenting. They can’t all be about outrunning voracious wild animals or barely escaping death at the hands of heavy machinery (I know – machinery doesn’t, strictly speaking, have hands, but you know what I mean). Still reading? Well good on you! 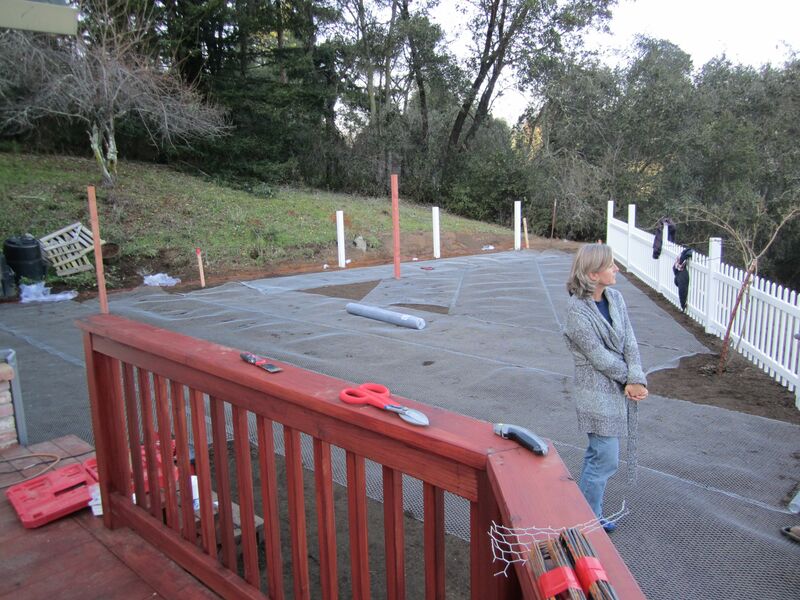 As you may remember from an earlier post, one of the first things we budgeted for when we moved up here was a new front deck. As useful and enjoyable as a deck is, fun wasn’t the only motivation behind the move. 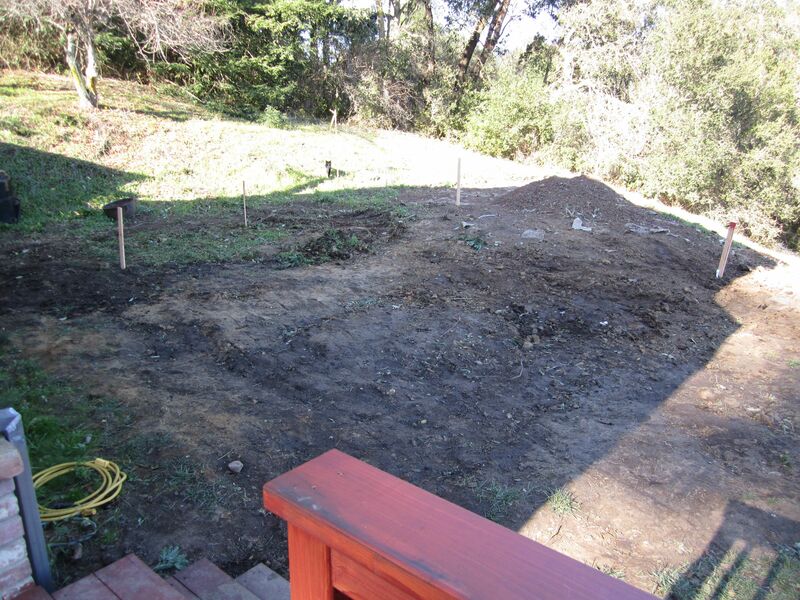 The front yard, as it was, was absolutely unfit for human life. You couldn’t go anywhere near it unless you were wearing knee-high boots and a body suit. It looked as if it hadn’t been maintained for a decade: packed dirt and thick, woody weeds shared space with tufts of painful thistle. Gopher holes were everywhere. I mean, for God’s sake, a warren of rabbits were living there. While this may look to the average eye like a photo of a cat frolicking – okay, maybe not frolicking, but you get the point – by some arid patch of weeds by the side of a highway, in truth the terrible blight you see in the foreground is actually what passed for our front yard. 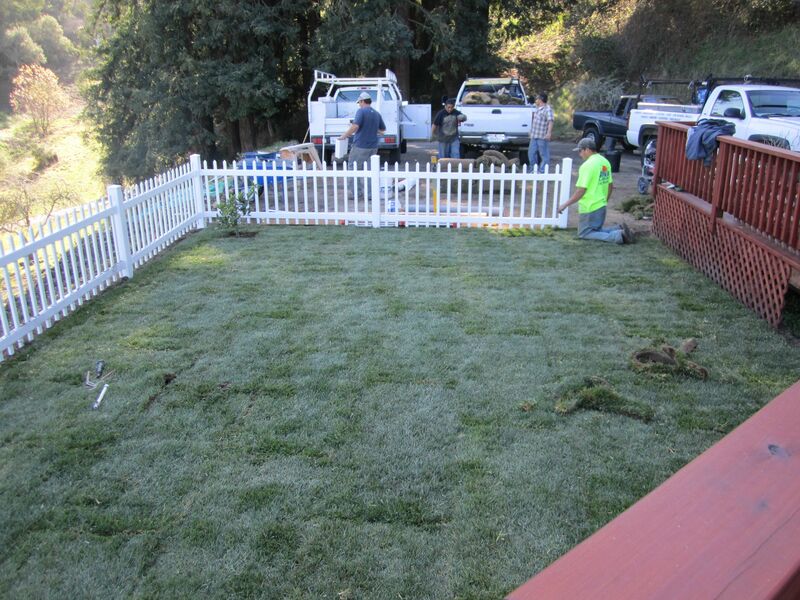 Putting a deck there took care of almost half of the square footage in front. The side, however, was even worse. In addition to the thistle and dirt, the ground here rose steadily to a heap in one corner where an unsightly, straggling Yew bush sat upon a mound of rust-colored volcanic gravel. It was horrible. And then, of course, we had a trench carved through it, which didn’t help. 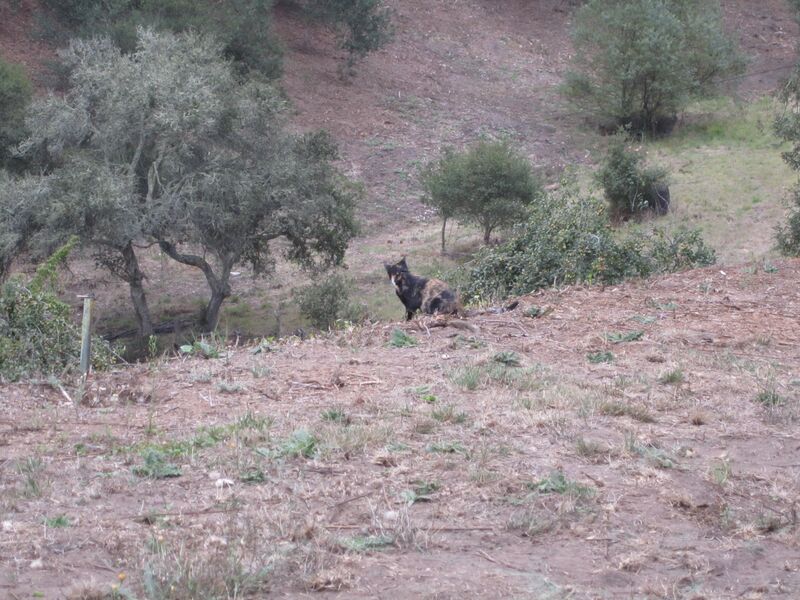 I took this picture (at left) from the center of the side yard, looking over the ridge to the barn down below. 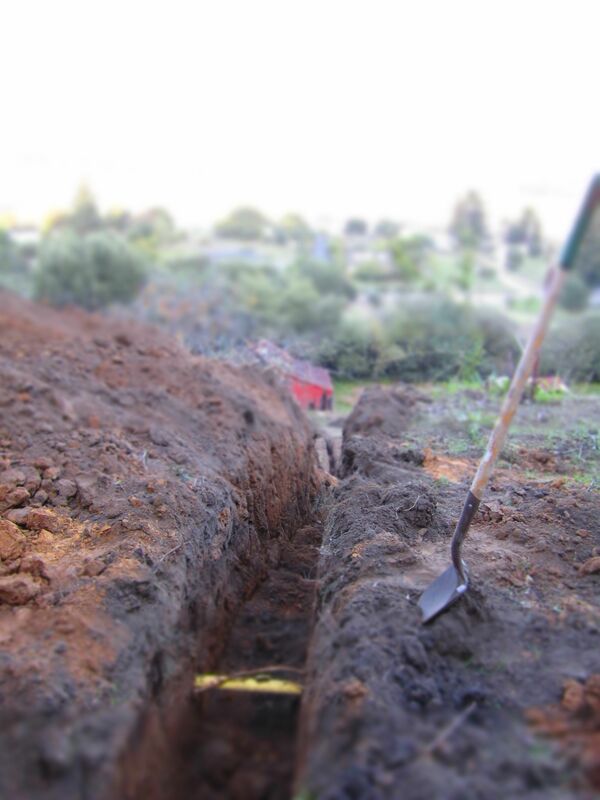 You can’t tell how bad the yard was, because of the trench, but you get the idea. And see that exposed yellow pipe? That’s the gas line. Nice. 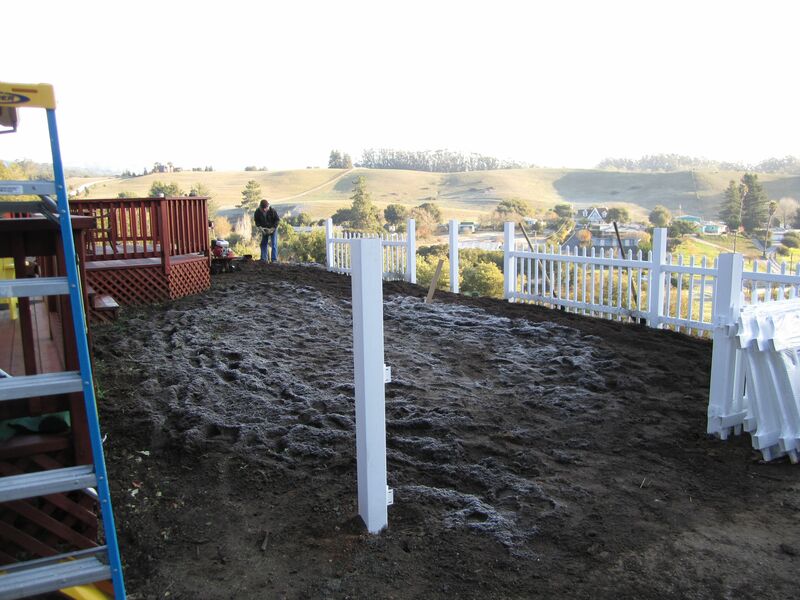 Once the deck was finished and the trench was filled (electricity having been run down the hill) we hired a landscaper to tear the whole mess of a yard up, grade it down, and till the thing to within an inch of its life. 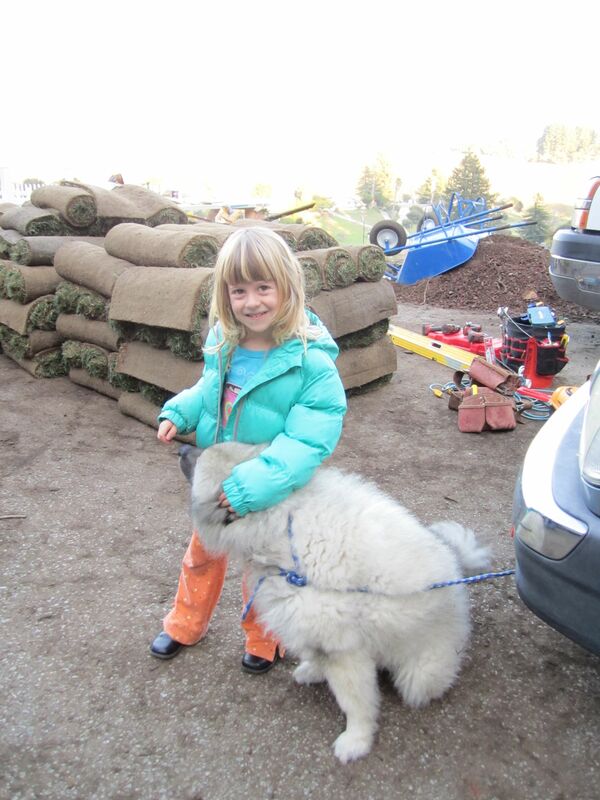 Add a layer of topsoil, rolls and rolls of gopher wire, a couple thousand square feet of sod and we’ve finally got a lawn! Not bad, huh? 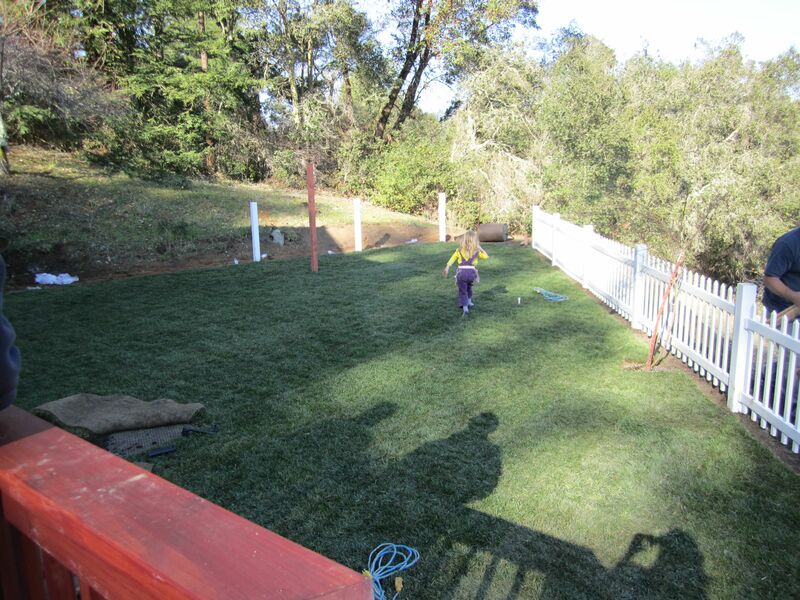 Once the fence was completely installed we had a pretty nice yard. 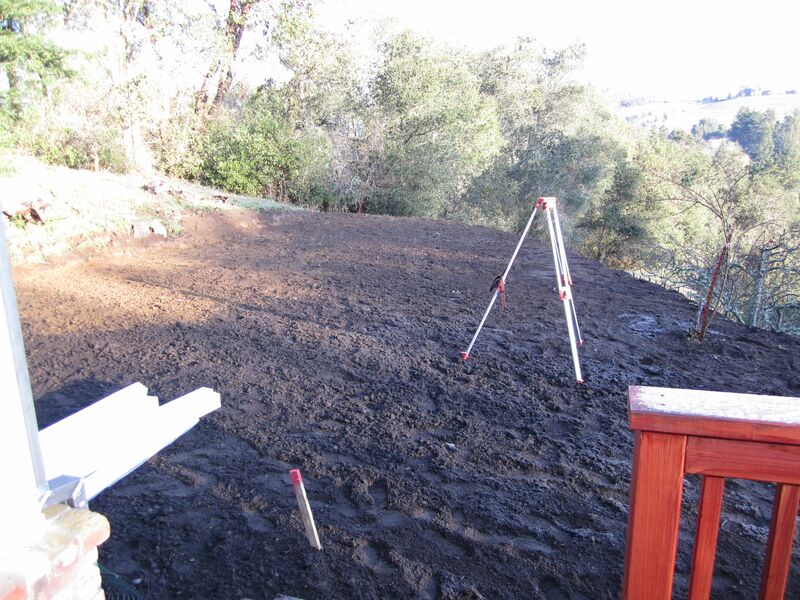 It’s a bit bare, of course, but we’ll be adding some shrubs and trees in the coming months. That’s it for now! Well, now that I look at it this post wasn’t so boring after all – there was even mention of some wild animals. Just because they’re the cute, hoppy kind with twitchy noses and cottony tails doesn’t mean they’re any less exciting. And they did seem voracious. Well, a bit. Your dream has come true. 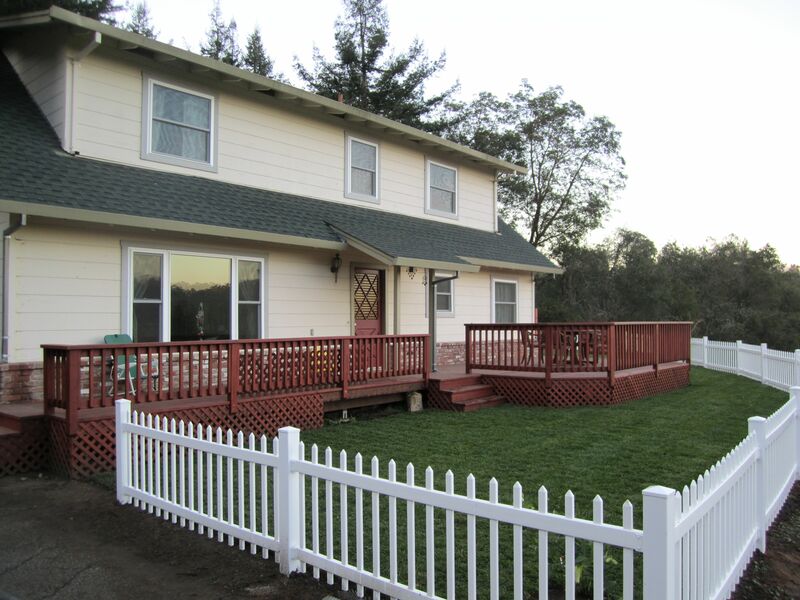 The deck and fenced yard is wonderful.